When the wafers are back, the cream is whipped, the sprinkles are out…let’s cheer! This cake is going to make your life easier. 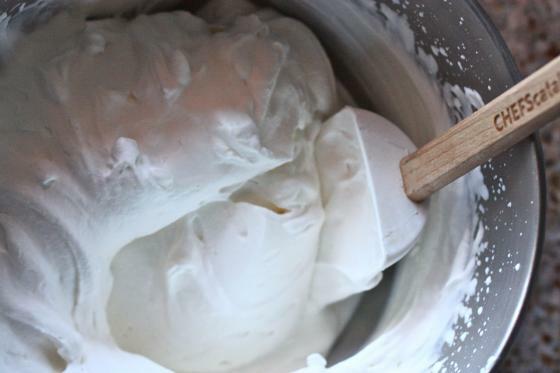 To start, it only involves three ingredients, you don’t need an oven and it’s completely fat-free! Hah! You’re right. I’m a no-good dirty liar. These little cakes are not fat free, but they will make your life easier. In my world, cream is considered it’s own food group. Tell me this: is there anything better in life than whipping up a cake with only three ingredients in five minutes flat, then sitting in your sweatpants on the couch with said cake in your lap? 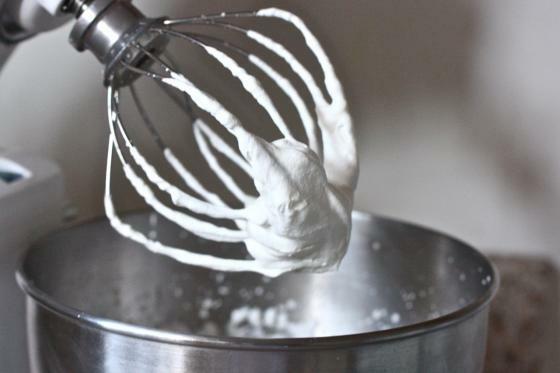 Whip cream with vanilla. Sandwich between four stacks of wafers (with four wafers in each little stack). Cover the outside of the cakes in cream and cover with sprinkles. Chill in fridge (or freezer) for at least an hour and a half before eating. Count On My Sweet Tooth! oh my gosh, i don’t even care if you’re a dirty liar…i’m going with calorie-free please and thank you! Wow those look unbelievable! I love personalized size/mini treats of any kind – ESPECIALLY when they only have 3 ingredients! It’s going to be a good morning! 🙂 Personal size anything rocks my world. YUM! I have to add this to my Holiday must makes!!! where did you find those wafers?? just at my grocery store–they always come out around this time of year…check your cookie section! I usually find these lovely cookies by the ice cream sundae fixins. The wafers make a great cheesecake crumb base too. Fabulous! I NEED those very sprinkles that you used on these mini-cakes. Where did you find them…????!!!!! at my regular grocery store in with the sugar and flour! It’s like you’ve read my mind! Just saw these cookies in the store for the first time this past weekend! Can’t wait to try them – thanks!! You did it again. HOW do you do this?!?! Haha… more like WHYYYYY…. need more time in the gym to work off these calories!!! 😉 Thank you, again, for this lovely dessert. but its so good once it hits your lips!! 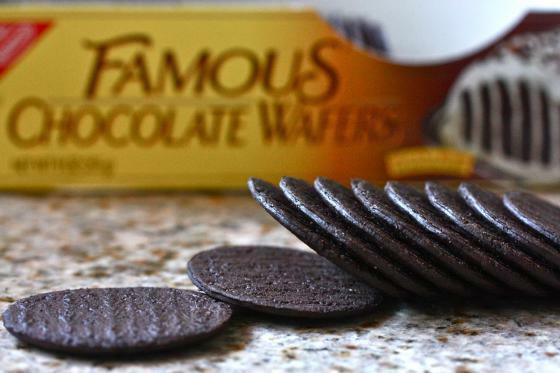 interestingly enough i have 2 packages of those wafers waiting for me in my kitchen! I love that these are personal desserts. I can’t wait to eat one all by myself! Yay! It’s an icebox babycake! We love! I have never bought those wafers before, only Oreos. 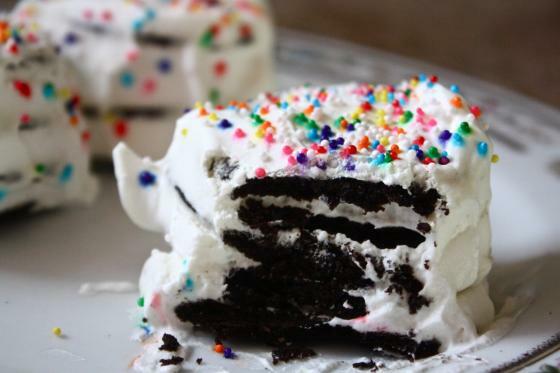 This is like making your own Oreo, except wayyyy better…hello real cream frosting, sprinkles,…oh, drool! I Love IT!! Adorable. Sprinkles make everything better. Good thing I “need” to go to the store right now. in theory. I didn’t wait because I have absolutely zero self control. Well, I did it. I made one of these today & am in love. So so good!!!! I ate it right out of the freezer & it was gone in 10.45 seconds! Mmm. 🙂 I love those sprinkles! That looks so decadent (and easy)! Oh these are adorable, my family will love these (um they’ll be more for me, though). Shhh. 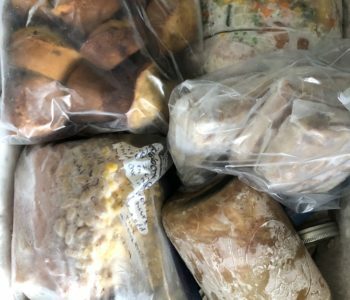 Frozen goodies are so underrated this time of year! And sprinkles just takes it to the next level! Love. These are so cute! Like Little Debbie Cakes but way, way better. P.S. I made your cinnamon toast muffins yesterday! How did you not burn your fingers dipping the just-out-of-the-oven muffins into the sugar? Regardless, they made my sick friend very happy. Even when sick, he’s manly enough to state his love for baked goods. Holy yum! This looks incredible! You had me at rainbow sprinkles and heavy cream. Mmmmm! Those look like little bites of heaven! I *love* three ingredient recipes. And clearly also cream. Great idea, this. DEEEELISH! These are adorable! I musy admit that one of my favorite holiday treats are the little debbie cakes shaped like christmas trees with white icing and spinkles…heaven! 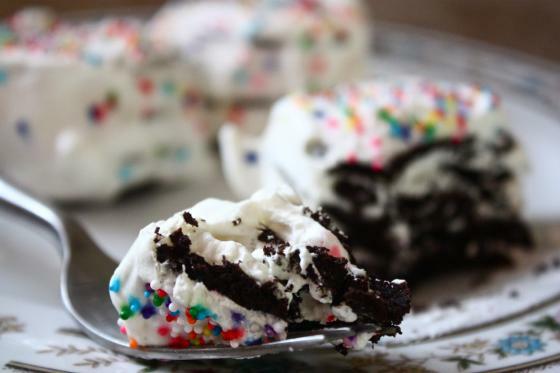 ah… these take me back to childhood… my mom would make them for her bunco parties, and we got to eat one beforehand… 😀 always my favorite treat! Now, if only they were gluten and dairy free. I need to come up with my own version. Christie, I was thinking the same thing! I’m going to scope out the gluten free cookies at my grocery and try to come up with a version. 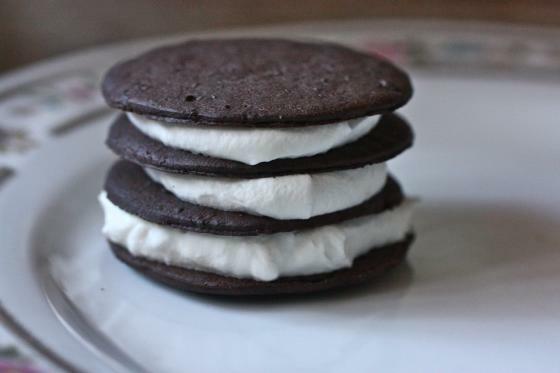 I can’t help but wonder if they’d be delish with coconut ice cream sandwiched in between too! Wow that looks amazing. Im drooling over here. Im sure it tastes even better than it looks! i have NO WORDS for what those look like! what a brilliant idea!!!!!!!! I’m making these tomorrow. I have company coming over and everyone needs to have their own cake. I think it makes life more special. our brain cells need fat. end of story. 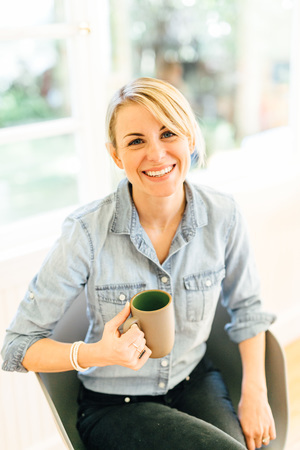 I lust over your blog on a daily basis. Looks amazing! Your recipes are always great! this is my favourite dessert! its a traditional christmas dessert for my family. i love how you added the sprinkles . . . sprinkles make everything better. thanks for posting. 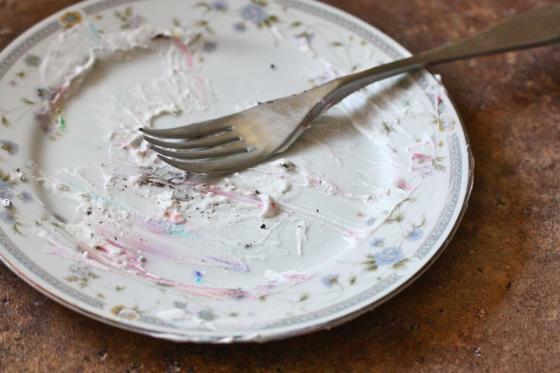 This is my dad’s favorite dessert! I like the colourful hundreds and thousands on top, reminds me of the iced sponge cake we used to have at school! I did it! I made these tonight, and I’m in love. 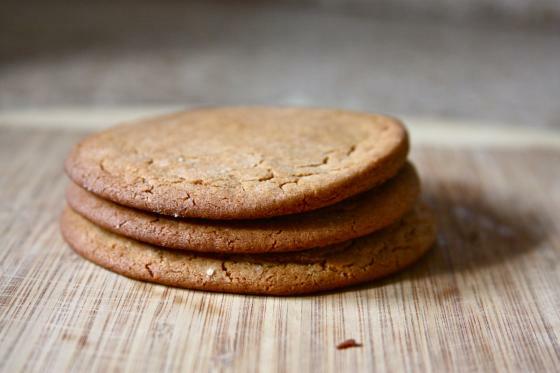 I used Pamela’s gluten-free cookies since I can’t have the wafers, and they turned out so great. So excited that I finally had the chance to make one of your desserts! This looks AMAZING. 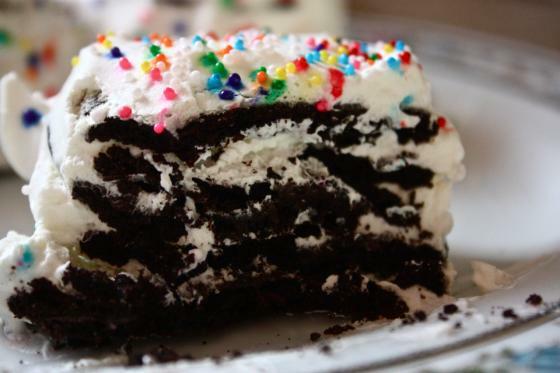 Much safer than making a regular ice box cake and eating the entire thing!